Hydraulic lime (HL) is a general term for varieties of lime (calcium oxide), or slaked lime (calcium hydroxide), used to make lime mortar which set through hydration: thus they are called hydraulic. The other common types of lime mortar set through carbonation (re-absorbing carbon dioxide (CO2) from the air) and are sometimes called air lime. Hydraulic lime provides a faster initial set and higher compressive strength than air lime and eminently hydraulic lime will set in more extreme conditions including under water. In Conservation Technology Ltd. we sell two varieties of NHL (Natural Hydraulic Lime) Secil Natural Hydraulic Lime and Roundtower Natural Hydraulic Lime. Secil, has been producing Natural Hydraulic Lime for over 100 years in Portugal. Secil NHL 2 , NHL 3.5 and NHL 5 all conform to the most recent European standards EN459-1:2010 and are supplied in 25kg bags, or used in a variety of mortars and plasters, all tried and tested in the Irish market. These limes are suitable for Historic Buildings and New build. Breathable, flexible and ecological. Stoneware Studios have collaborated with Secil to bring this high quality range to the Irish market. Secil have similar strengths to the French NHL’s and are suitable for plastering, rendering, bedding, pointing, limecrete etc. 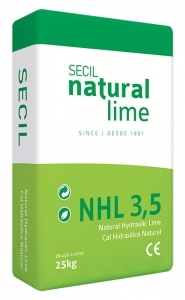 Why Choose Secil Natural Hydraulic Lime? Secil Natural Hydraulic Lime (NHL) features the same properties it used to have, decades ago, before the introduction of Portland cement. It is an exclusive result of the chemical composition of its natural raw materials. Our Natural Hydraulic Lime features a unique brownish colour due to the characteristics of the stone that we extract from our quarry, which is the same used since the beginning of the unit’s existence. Regular tests are carried out in our laboratory to ensure our NHL maintains the same specifications and quality. 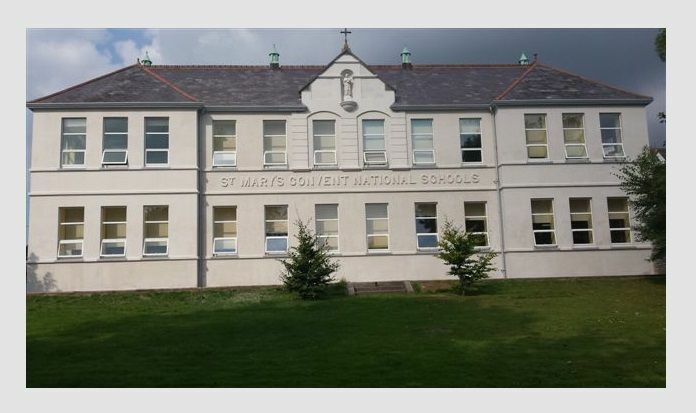 Secil Render – Pre-mixed lime mortar including sand, NHL lime and fibres, for plastering and rendering. Can be applied with trowel or by spray application. Secil RJ35 Pointing Mortar– Pre-mixed lime mortar formulated for Pointing Stone. Secil Finishing Plaster – Pre-mixed lime plaster for finishing lime render outside and lime plaster inside. Secil Consolidation Mortar – Pre-mixed lime mortar for preparing walls for Secil EcoCork insulating plaster. Secil Grout – Pre-mixed lime grout for filling internal hollows and cavities in stone walls. Secil Screed – Pre-mixed Lime screed for flooring. Secil EcoCork insulating plaster – Pre-mixed lime plaster with natural cork. Secil AdhereVit – Pre-mixed lime mortar for fixing Cork insulation boards. Reabilita RA05 – this macroporous plaster is for the treatment of salt infestation, efflorescence and cryptoflorescence, including salts arising from rising-damp and cement related sulphates. Reabilita RR20 – This is a plaster system designed for the repair of early cement renders. Roundtower Limes has been used in thousands of jobs from Derry City Walls to Mizen Lighthouse. Manufactured by Socli, the largest producer of Naturally Hydraulic Lime in France, this range of limes gives first class results, full breathability and vapour permeability, great flexibility, minimal shrinkage and, most importantly, stability over time. 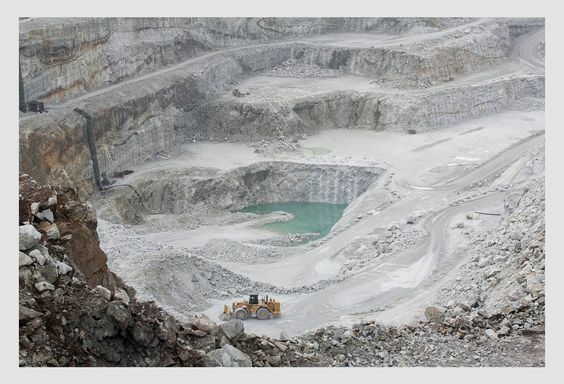 This lime is unblended and has been a critical element to the success of thousands of projects throughout Ireland and the world..
With its two lime quarries and manufacturing plants, Socli is one of the leading companies in the manufacture of Naturally Hydraulic Lime in the World. Created in 1863, the factory of Sauveterre-la-Lémance is one of the oldest in Europe in the production of Natural Hydraulic lime while the factory of Izaourt (Founded 1903) is also one of the most important producers of Natural Hydraulic lime in the World by virtue of its four vertical kilns, extensive test laboratories and superb training centre. Roundtower Natural Hydraulic Limes are natural products. They contain no additives and are not blended. 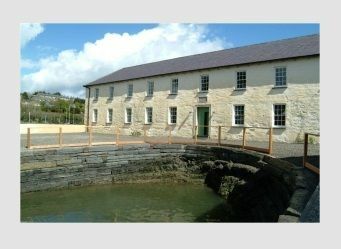 Roundtower Natural Hydraulic Limes are suitable for building restoration and conservation. Equally, they are very suitable for new construction and engineering works. Roundtower Natural Hydraulic Limes are recommended for mortars, plasters, concrete and grouts. There are three grades of Roundtower Natural Hydraulic Lime: NHL2, NHL3.5 and NHL5. What is Naturally Hydraulic Lime? Natural Hydraulic Lime (NHL) is obtained by the calcination of argillaceous or siliceous limestone. The burning process produces calcium oxide and calcium silicates and calcium aluminates. The resulting material is ground, hydrated and carefully packaged. The resulting Natural Hydraulic Lime, when put in contact with water, will set and harden. Carbon dioxide present in the air also contributes to this hardening process. Natural Hydraulic Lime is mixed on site with suitable aggregates to give compatible, flexible, breathable and beautiful plasters and mortars. In conjunction with this, its very special hydraulic set gives the added benefit of robustness and long-term durability. Why choose Roundtower Natural Hydraulic Limes ? Natural colours suitable for both conservation and new build. Excellent sand colour reproduction. Compatibility & Suitability – variety of strengths and colours available to suit existing mortar, whatever age. Suitable compressive strength – range allows for choice of compressive strengths. Compressive strength is achieved gradually, allowing for movement. Stability. Some limes are prone to cracking in the medium term (3months-2 years) as carbonation continues to take place. Roundtower has an even distribution of free lime that allows for stable continuous build up of strength with no stresses and associated cracking. Low alumina content – less susceptible to attack by salts. alkali-silica reactions impossible. Excellent performance even in marine environment. Purity – No addition of any kind. No need for blending – no need for pozzolans, cement, plasticizers, water retainers, waterproofers etc. Self-healing properties – Free-lime content also gives the mortar self-healing properties. Reworking – all Roundtower Natural Hydraulic limes can be re-worked within 24 hours. 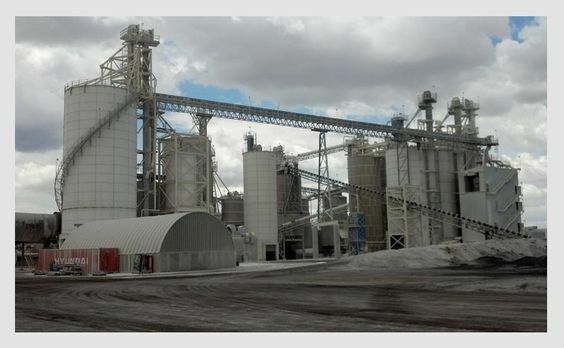 Economy – low bulk density means good economy and superior volumes of mortar. Elasticity – no expansion joints, minimal shrinkage and cracking. 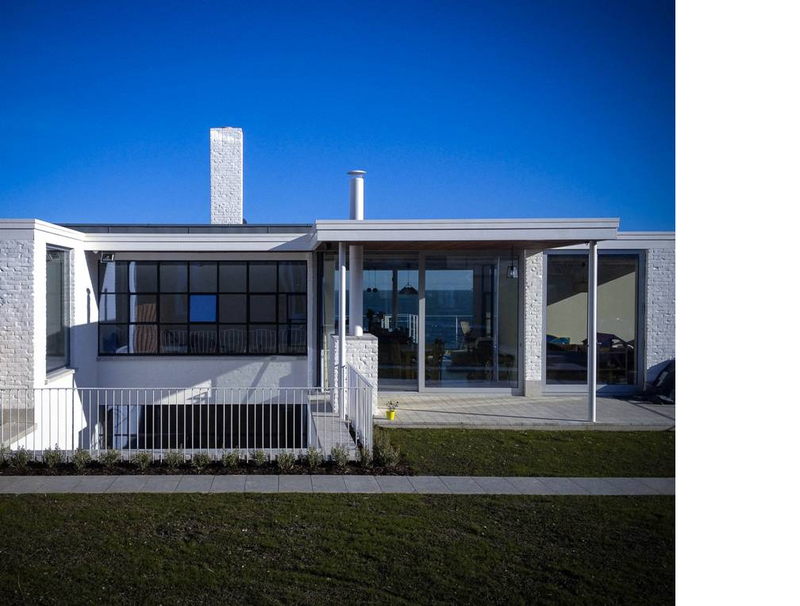 Permeability – condensation dispersion, reduces rot, healthy living environment. Resistance to weather – quick setting means less need for protection from adverse weather conditions compared to Fat lime mortars. Resistance to bacteria & vegetable growth – alkalinity of lime inhibits growth. Insulation – permeability reduces moisture in structure. Recycling – building materials used with Roundtower Natural Hydraulic Limes can be recovered and re-used. CO2 Absorption – Natural Hydraulic Lime re-absorbs CO2 during carbonation of the free lime. Variety of international reference projects. First class quality technical back-up service. Tests are carried out in accordance with EU Norm, EN-459 and under strict laboratory conditions. All mortars tested adhere to the EU test mortar norm of 1 Binder:1.13Aggregate Mix. Aggregate used in all tests is EU standard laboratory sand(ISO0679). NHL2 NHL3.5 NHL3.5 White NHL5 Why is this important? Our NHL3.5 White is the most white/brightest Natural Hydraulic Lime available on the market- it is the best material to use where sand colour reproduction is of priority. The exceptional fineness of Roundtower Natural Hydraulic Limes gives an excellent plasticity and encourages high quality plastering workmanship. The near zero expansion of of NHL binders and the elasticity of pure NHL mortars are such that joint free construction is possible. Binders are bought by weight and used by volume. Bulk density is important in evaluating economy comparisons . The Blaine value establishes the area that a gramme of lime can cover. A high value gives the lime a natural “Fatty”, plastic consistency, much loved by the user. A high value also ensures minimal shrinkage and associated cracking. Free water is the moisture that is not combined with the material. Excessive free water(>2%) can cause a premature hydraulic set. Roundtower’s low Free Water content allows for long shelf life under normal enclosed warehouse conditions. Early initial set with slow long term hardening. Early strength achievement is excellent in fighting frost attack. If applied properly, NHL mortars will achieve great durability. 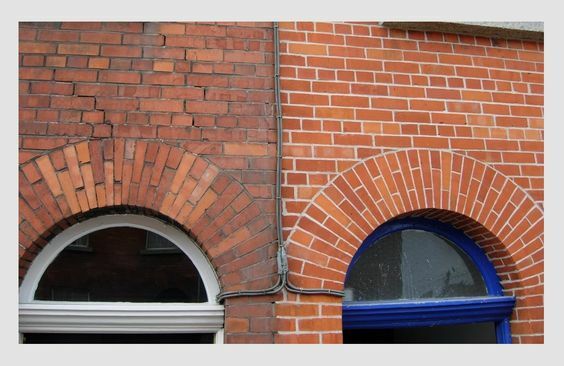 Flexible mortars are essential to avoid cracking and are particulary suitable for solid masonry construction. 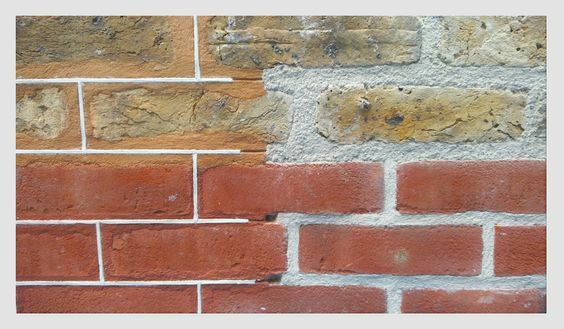 Less than 3% has no detrimental effect on Lime or Lime mortars. The minute amounts of SO3 present come from the fuel used during calcination and not the raw material. 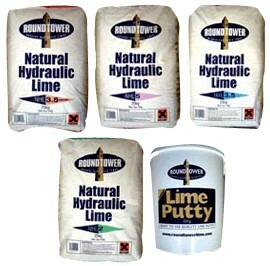 Roundtower Natural Hydraulic Limes high percentage of Free Lime gives mortars exceptional workability and self-healing properties. The presence of Gypsum can cause expansion, eflourescence and failures, especially in marine climates. Roundtower Natural Hydraulic Limes are all suitable for use in marine conditions. Reacts with Sea Salts and other Sulphates. Can affect brick and stone. Presence of Alkalies, Potassium or Sodium, can cause Alkali/Silica reaction. Reacts with the silicates in cement and sand producing gradual disintegration. Unslaked lime will expand when hydrated. Makes products unstable. Due to absence of setting agents, NHL mortars can be re-worked up to 24 hours. Essential for minimising waste on site. The percentage of Active Clay will indicate a mortars hydraulicity. Roundtower Natural Hydraulic Limes conform to the standard EN-459. The loss on ignition is the sum of the free water, bound water and carbon dioxide.